The rostrum is composed of five segments. 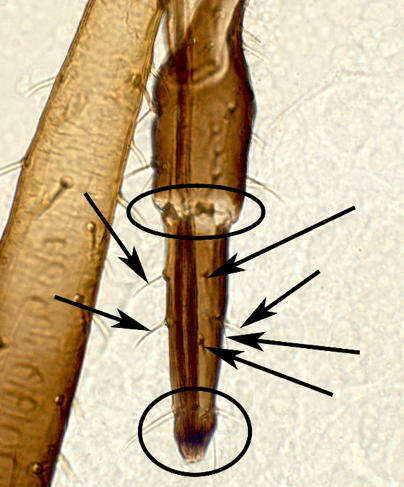 It contains a sclerotized groove in which the stylets sit and extend back and forth as they access the phloem. This sclerotized groove is in most of the second rostral segment and all of segments three, four, and five. 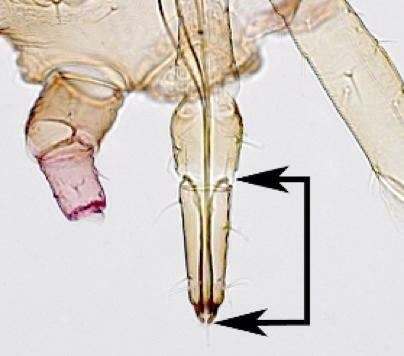 In many aphid species, the fifth segment is hard to distinguish from the fourth, so they are often treated together as the "ultimate rostral segments", or simply URS. URS is usually used in the singular. The ultimate rostral segments are the fourth and fifth segments treated together. The length of the URS is measured from the basal end of the fourth segment to the distal end of the fifth. Here the fifth segment is diminutive and hard to distinguish from the fourth. In some cases the fifth and fourth segments are easily distinguished. Even when the two segments are easily distinguished, the URS sill encompasses both. The URS comes in many shapes and sizes that are often correlated with host preference. For example a short, stubby URS is often the sign of a grass-feeding aphid. 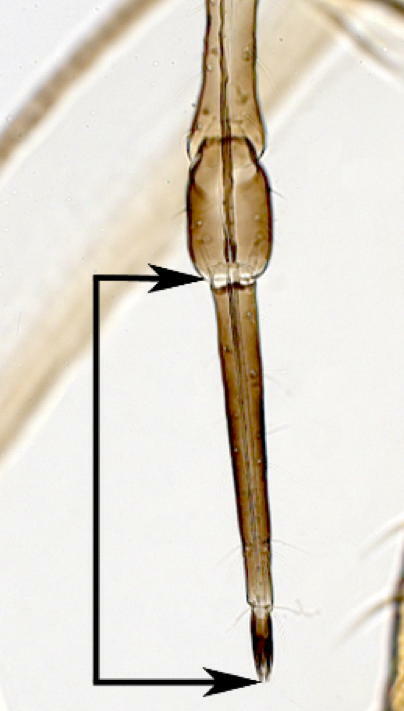 This thin and elongate URS belongs to Greenidea psidii. The URS often, but not always, carries large accessory setae along the length of the fourth rostral segment. The URS also has primary setae at the basal end which are hard to see except under high magnification. It also carries primary setae at the distal end of the fourth rostral segment. Because the number of primary setae is invariant, only the count of accessory setae is used to identify aphids. Some of the accessory setae are highlighted with arrows. The primary setae, some of which are not visible, are within the ovals.